The hide has a beaded appearance because it is made of tightly woven scales that each enclose a rounded particle of bone. Gila monsters are one of the largest lizards in North America and one of the rare lizards that are venomous. Unmistakable in appearance, they have a sausage shape, a heavy head and four stubby legs covered with a mottled pink and black hide. The hide has a beaded appearance because it is made of tightly woven scales that each enclose a rounded particle of bone. 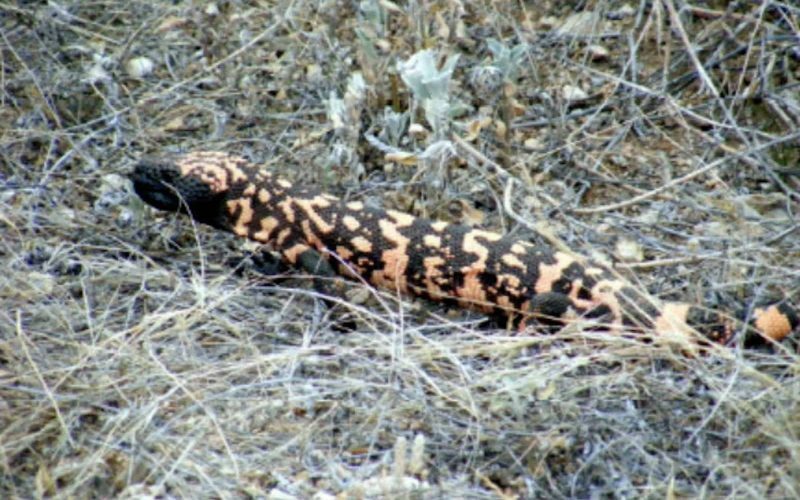 Adult Gila monsters are approximately 1.25 foot long, weigh 1.5 to 2 pounds. They are native to southwestern U.S. deserts and northwestern Mexico. Ectotherms, Gila monsters are seldom active, coming out of underground burrows only to mate and eat. Their prey is newborn rabbits, rodents and bird eggs, and they can eat one-third to one-half their body weight in a single meal. Gila monster females lay 5-12 leathery eggs in late summer and the young ones appear the following spring looking like miniature adults. Gila monsters are not aggressive to humans, but they should never be handled. While they appear to be slow, their bite is extremely swift and painful. The venom comes from modified spit glands in their lower jaw delivered by dagger-like teeth with grooves, it is not injected into the victim by way of fangs in the manner of a rattlesnake. Once a Gila monster bites, it clamps its jaws shut and chews the venom into the bite. This photograph was taken in May 2007 near the Sabino Lake dam.